Η ινδική Tata παρουσίασε το Pixel concept στη Γενεύη. Βασισμένο στο Nano, το Pixel μπορεί να μεταφέρει τέσσερις επιβάτες, διαθέτει τεράστιες πόρτες που ανοίγουν προς τα πάνω, πανοραμικό παρμπρίζ και φουτουριστικά φωτιστικά σώματα. Το εσωτερικό έχει μινιμαλιστική σχεδίαση με υψηλής ποιότητα υλικά καθώς και ένα σύστημα αφής ενημέρωσης και ψυχαγωγίας. Μηχανικά φορά τον τρικύλινδρο turbo 1200αρη που διαθέτει τεχνολογία Start/Stop. Επιδόσεις δεν ανακοίνωσαν οι Ινδοί πέραν του ότι καταναλώνει 3.4 λίτρα/100 χλμ και έχει εκπομπές CO2 89 γρ/χλμ. 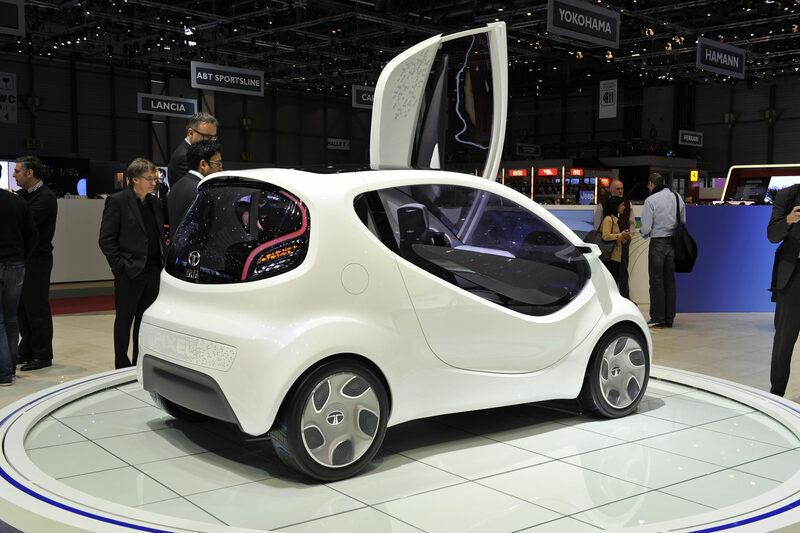 The Tata Pixel, with ‘Zero Turn’ drive and an innovative diamond-shaped door system, is a new city car concept for Europe from Tata Motors. Based on the Tata Nano, the Pixel – at just over three metres in length – is the most package efficient four-seater in the world, comfortably accommodating four adults, unlike a typical city car which is either a two-seater or can accommodate two adults and two children only. The Tata Pixel’s ability to manoeuvre and park in the tightest of spaces is made possible by its Zero Turn toroidal traction-drive Infinitely Variable Transmission (IVT). This highly efficient, cost-effective system assists rotation of the outer rear wheel forwards and the inner rear wheel backwards during low-speed manoeuvres, while the front wheels turn at acute angles. The result is a turning circle radius of just 2.6 metres. The glass area on the scissor doors provides excellent visibility even in the most extreme turning manoeuvre. The ‘scissor’ doors rotate upwards from the front to allow all four passengers to effortlessly enter or exit the Tata Pixel, even in the tightest of spaces, while the doors’ large glass area provides excellent visibility. A forward sweeping roofline, with minimal front and rear overhangs, accentuates the youthful styling, while the window graphic features an interchangeable island that can be used to change the exterior appearance whenever desired. 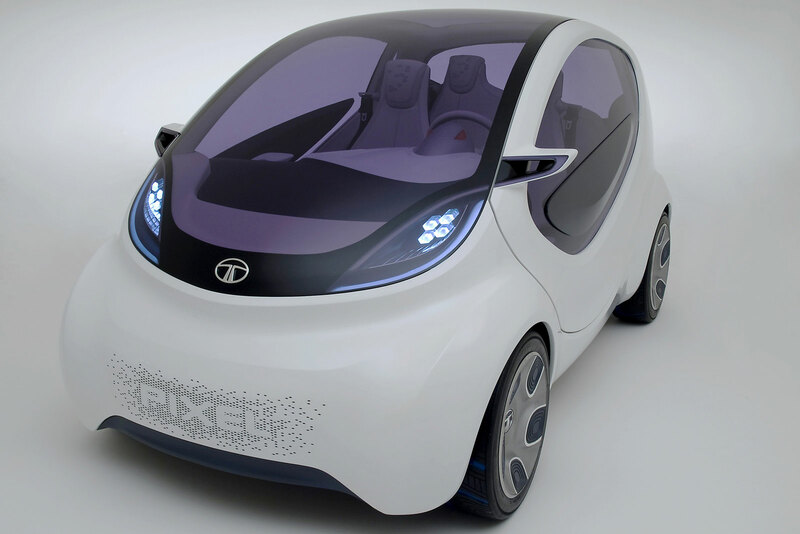 The Tata Pixel also introduces ‘My Tata Connect’ — the first integrated human-machine interface (HMI) concept from Tata Motors for its new generation programmes. 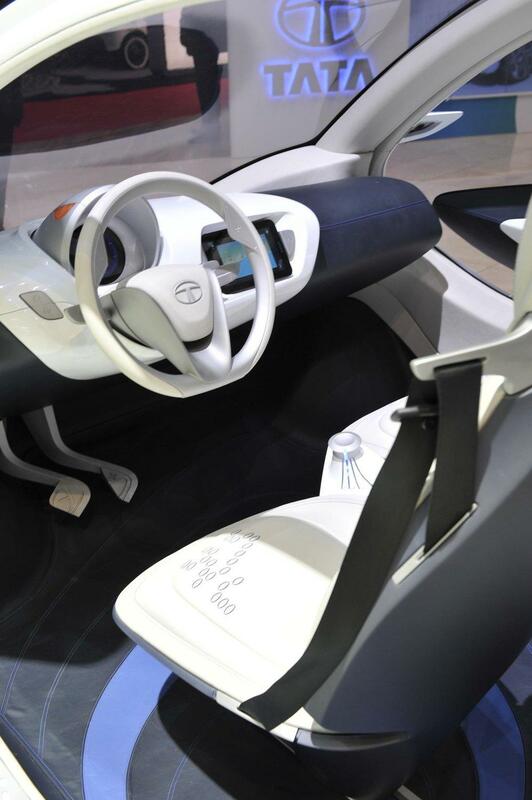 ‘My Tata Connect’ enables seamless integration of the user’s smartphone or tablet with the vehicle’s infotainment system and also allows controlling key functions of the car. 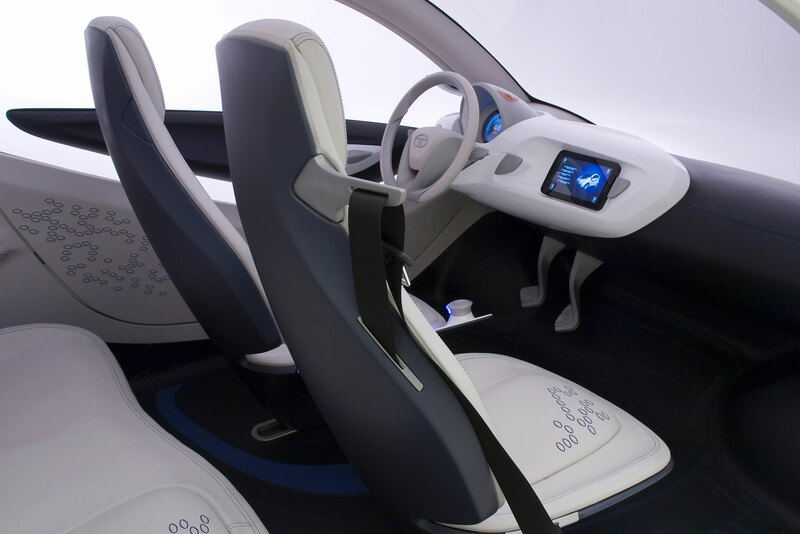 This provides a customised, user friendly, all-in-one touch screen display, while also allowing the driver to remain seamlessly connected to the external world in much the same way as they would be when at home or in the office, listening to favourite songs, internet news and sport or stock updates. In addition to serving as the infotainment display when docked in the instrument panel, the tablet also allows temperature, ventilation and air-conditioning settings to be adjusted through its touch screen, as well as displaying information on the vehicle’s performance. A 1.2 litre three-cylinder turbocharged diesel engine, positioned at the rear of the Tata Pixel, gives lively performance. The engine is a low-friction design, featuring variable coolant and oil pump and rapid warm-up technologies. With optimised aerodynamic drag, low rolling-resistance tyres, stop-start technology, and intelligent battery charging, the Tata Pixel returns European combined cycle (NEDC) fuel economy of 3.4 l/100km and CO2 emissions of just 89g/km. 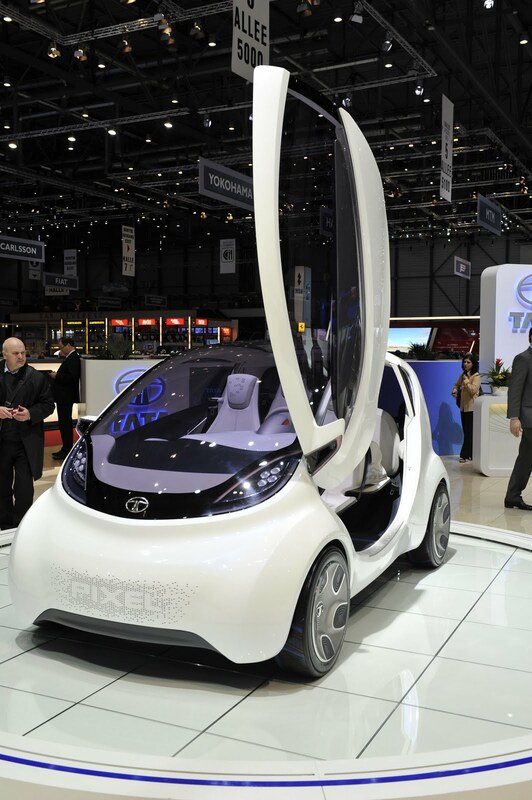 Tata Motors today presented at the 81st Geneva Motor Show the Tata Pixel, a new city car concept for Europe. Based on the Tata Nano, the Tata Pixel – at just over three metres in length – is the most package efficient four-seater in the world, comfortably accommodating four adults, unlike a typical city car which is either a two-seater or can accommodate two adults and two children only. The Tata Pixel’s ability to manoeuvre and park in the tightest of spaces is made possible by its Zero Turn toroidal traction-drive Infinitely Variable Transmission (IVT), which assists rotation of the outer rear wheel forwards and the inner rear wheel backwards, while the front wheels turn at acute angles. The result is a turning circle radius of just 2.6 metres. The ‘scissor’ doors rotate upwards from the front to allow passengers to effortlessly enter or exit the Tata Pixel, even in the tightest of spaces. A forward sweeping roofline, with minimal front and rear overhangs, accentuates the youthful styling. The Tata Pixel is also designed to provide a high level of connectivity. 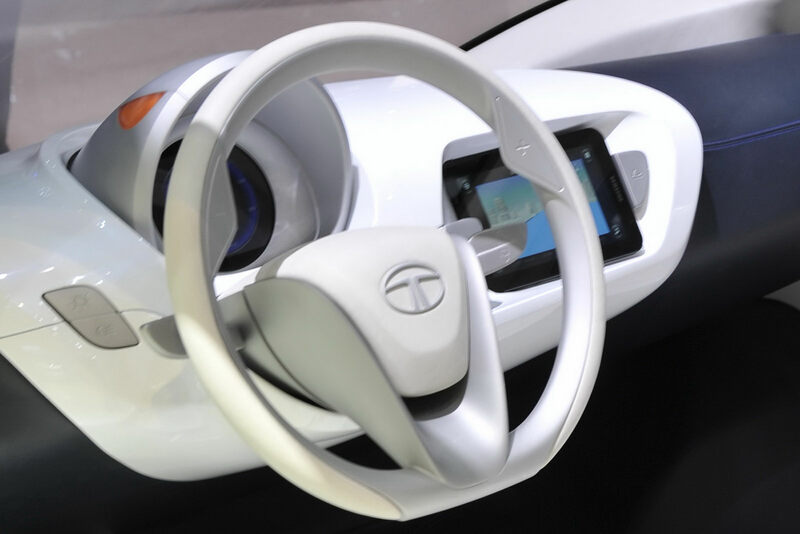 Key functions are controlled by the driver’s smart phone, running ‘My Tata Connect’ — the first integrated human-machine interface (HMI) concept from Tata Motors. A 1.2 litre three-cylinder turbocharged diesel engine, positioned at the rear of the Tata Pixel, gives lively performance. 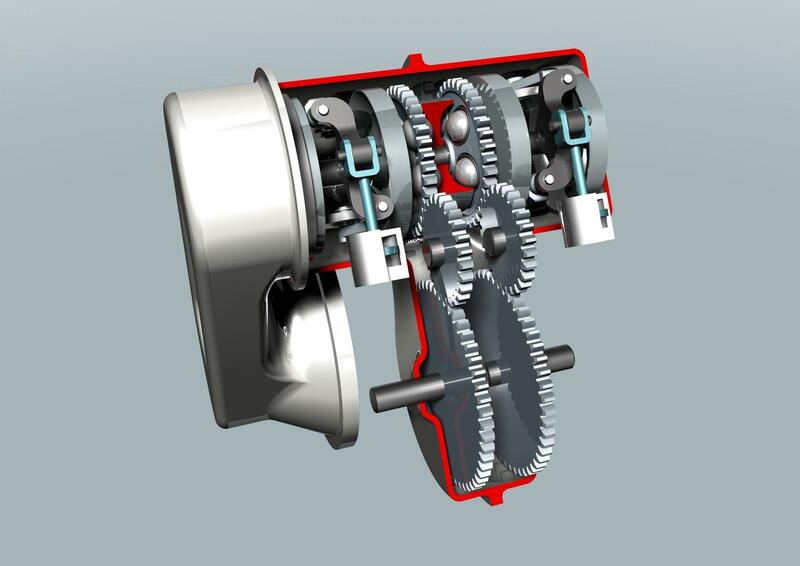 The engine is a low-friction design, featuring variable coolant and oil pump and rapid warm-up technologies. With optimised aerodynamic drag, low rolling-resistance tyres, stop-start technology, and intelligent battery charging, the Tata Pixel returns European combined cycle (NEDC) fuel economy of 3.4 litres/100km and CO2 emissions of just 89g/km. Taking its pursuit of electric vehicles forward, Tata Motors is also displaying the Tata Indica Vista Electric Vehicle at the Motor Show’s Green Pavillion. The Tata Indica Vista EV will be made available to fleet customers this summer in the UK. 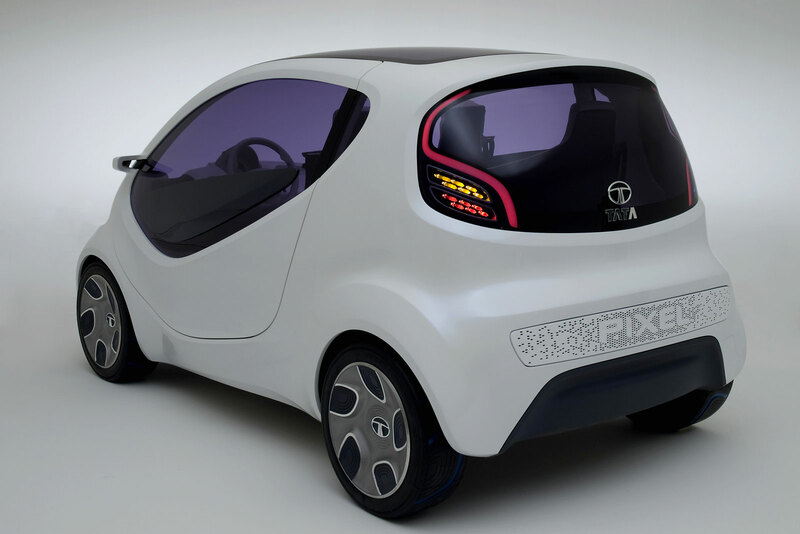 The four-seater family car has a predicted range of up to 160 km. The Tata Indica Vista EV bagged two trophies for its performance at the Royal Automobile Club’s Brighton-to-London Future Car Challenge. A special version, the Tata Indica Vista EVX, participated in the Progressive Insurance Automotive X Prize contest, one of the world’s most prestigious events for environment-friendly vehicles. The company’s displays also include the Tata Aria, the first Indian four-wheel drive crossover, which was launched in India recently to rave reviews, the Tata Indigo Manza, among India’s best selling sedans scheduled for launch this year in select countries, and the Tata Indica Vista, a top selling hatch already launched in select geographies. 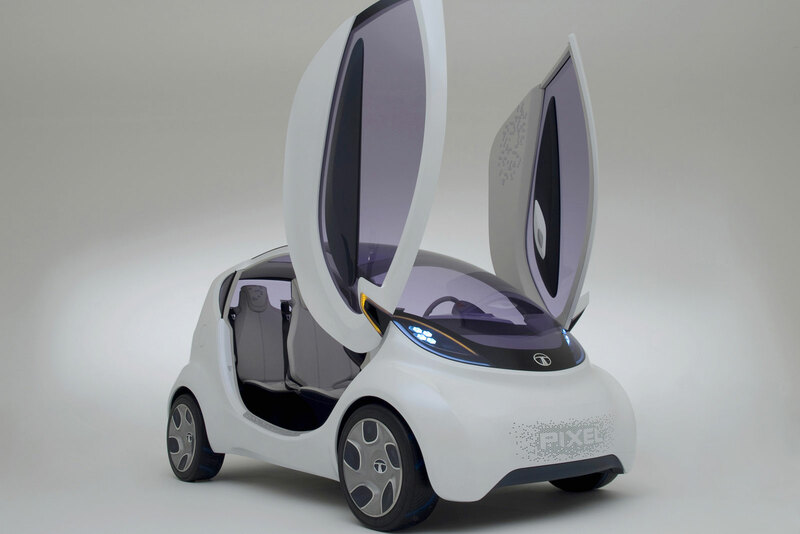 In Europe, the Indica Vista has already been introduced in Poland and Italy, and is planned for launch in Spain. The Tata Aria too will be launched, further enhancing the company’s portfolio in these markets.